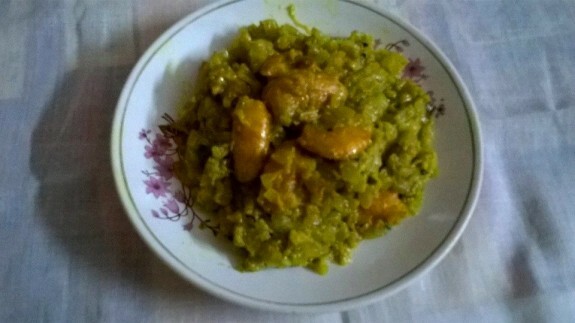 Lau Chingri or Bottle Gourd with shrimps is one of the popular Bengali recipe that magnificently enhances the flavour of lau and chingri and gives delicate taste to this recipe. Everyone should try this recipe at home. 1. Cut the bottle gourd into small and thin pieces. 2. Clean the shrimps properly and remove the black thin stripes from the shrimp to clean it properly. Marinate it with turmeric powder and little salt and keep it for 5 minutes. 3. Heat 4 Tbsp mustard oil in a pan and add cumin seeds, bay leaf and red chilli. 4. When the cumin seeds start crackle, add shrimps into the oil and stir fry it for 3-4 minutes. 5. Now add bottle gourd, salt, 3 green chillies and turmeric powder. Mix it well. Saute it for 3-4 minutes. 6. After that, add ½ cup or more or less warm water to cook the bottle gourd. 7. Now cook the bottle gourd in medium flame and cover it for 10 mins. In between remove the lid and sauté it and check whether the bottle gourd has been boiled or not. 8. Now mix corn flour in small water and add it with the bottle gourd. Add sugar and mix everything well. 9. Add garam masala powder and ghee and mix it well before removing it from the heat.